This article or section is a short summary on Super Smash Bros. Ultimate. This article or section is about an upcoming or recently released game. The content here is subject to change as more information is discovered. All information added here must be verifiable. Super Smash Bros. 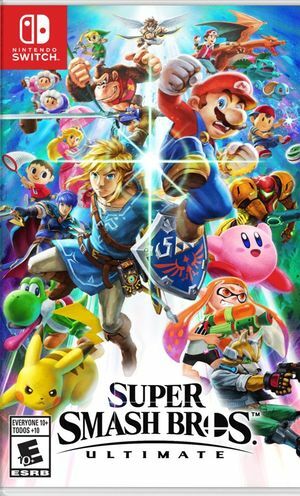 Ultimate is the fifth and latest entry in the Super Smash Bros. series. Like all games in the franchise, it has fighters from several Nintendo franchises battle each other, and just like the previous entries, it features some Pikmin elements. The first Pikmin-related information about the game was revealed in the Nintendo Direct that took place on June 12th, 2018. Captain Olimar returns as a fighter. His moveset and appearance seem mostly identical to his Super Smash Bros. for Nintendo 3DS and Wii U incarnation, meaning he can only have 3 Pikmin at a time, uses Winged Pikmin to recover, etc. When grabbing, Olimar issues all Pikmin to lunge forward and pin the opponent in place. Olimar himself can then deliver backhanded slaps to the opponent as a grab pummel. When Olimar is knocked back, his helmet can appear covered in cracks. The helmet returns to normal when the hitstun period is over, though. The helmet can also appear similarly cracked when he is Screen KO'd. This feature is only aesthetic. As seen in Olimar's trailer, Alph also is also playable in Super Smash Bros. Ultimate, as an alternate costume to Olimar. He plays identically to Olimar himself. Distant Planet: The same stage that debuted in Super Smash Bros. Brawl and returned in Super Smash Bros. for Nintendo 3DS. It looks like it has received a graphical update, since the Red Bulborb and Cloaking Burrow-nits that decorate the background are much more detailed and are now animated. Garden of Hope: The same stage that debuted in Super Smash Bros. for Nintendo 3DS and Wii U, although it looks more detailed, particularly in the on-stage flower pot. Main Theme - Pikmin Remix created for Ultimate Starter A remix of the title theme in Pikmin. Main Theme - Pikmin Original from Pikmin Starter The title theme in Pikmin. Forest of Hope Original from Pikmin Unlockable The Forest of Hope's theme. Plays the standard version first, and then the combat variant. Stage Clear / Title Theme - Pikmin Remix created for Brawl Starter A remix with the sunset fanfare and the title theme, both from Pikmin. Environmental Noises Track created for Brawl Starter Sounds from the wilderness that can be found within the Pikmin games. World Map - Pikmin 2 Remix created for Brawl Starter A remix of the area selection theme in Pikmin 2. Stage Select - Pikmin 2 Remix created for Brawl Starter A remix of the area selection theme in Pikmin 2, ending with part of the area selection theme in Pikmin . Garden of Hope Remix created for Ultimate Starter Remix of the Garden of Hope's standard theme and Bingo Battle's nature stage theme. Garden of Hope Original from Pikmin 3 Unlockable Garden of Hope's standard theme. Mission Mode - Pikmin 3 Remix created for Smash 4 Starter A remix of Mission Mode's standard theme in Pikmin 3. The Keeper of the Lake Original from Hey! Pikmin Starter The Keeper of the Lake's theme. Flashes of Fear Original from Hey! Pikmin Starter Flashes of Fear's theme. Over Wintry Mountains Original from Hey! Pikmin Starter Over Wintry Mountains's theme. Fragment of Hope Original from Hey! Pikmin Starter Fragment of Hope's theme. This plays in the third phase of the fight against the final boss. Notes: The table should hold an image of each spirit. Also, it should be mentioned somewhere what spirits can be summoned, and how. Also, more info on each battle would be great. The Burrowing Snagret makes an appearance in this game as an Assist Trophy. When summoned, it will appear from the floor (even go-through platforms) near an opponent, and will idle for a second before unleashing three quick stabs towards the opponent. It can peck at the ground or the air. It will then bury back down and reemerge elsewhere, repeating the process. Like other Assist Trophies, it can be KO'd if it takes enough damage. It makes the Burrowing Snagret death sound from Pikmin when it emerges, and also when it is KO'd. The Hocotate Bomb returns as an item, and acts and looks the same as before. In World of Light, Captain Charlie's spirit can be found by going west, south, south, and south. When defeated, the caves become available to explore, and Captain Charlie is the one who takes the player's spirits on the expedition inside the cave. Captain Olimar, three Pikmin, and Luigi in the Distant Planet stage in Super Smash Bros. Ultimate. 3D animated Cloaking Burrow-nits appear in the background. 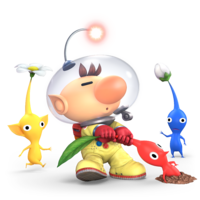 The five types of Pikmin Olimar can once again pluck in Super Smash Bros. Ultimate. The Burrowing Snagret Assist Trophy. Alph’s official art in the game. The official website, put up right after the E3 Nintendo Direct, has a page for Olimar as a fighter, but his name started off misspelled as "Olimer", in the banner at the back of the page. This only happened in the desktop site, as the mobile site was fine. The problem was only fixed on June 19th, 2018. This page was last edited on April 16, 2019, at 15:47.